They say that all good things must come to an end — and in television, it’s no different. While fans are always sad to see shows end, there comes a time when the story has been told and it’s time to move on to the next project. Then there are other times when a show is cancelled before it’s over, but understandably. There are many things that can lead to a show’s cancellation: low ratings, money, difficult cast, or even social media controversies. But in the end, if shows don’t catch with audiences, then networks will cancel them and just move on. And then, there are those rare times when, even if a show is a major hit and has a truly dedicated following, that the network will pull the plug for reasons unbeknownst to the fans. 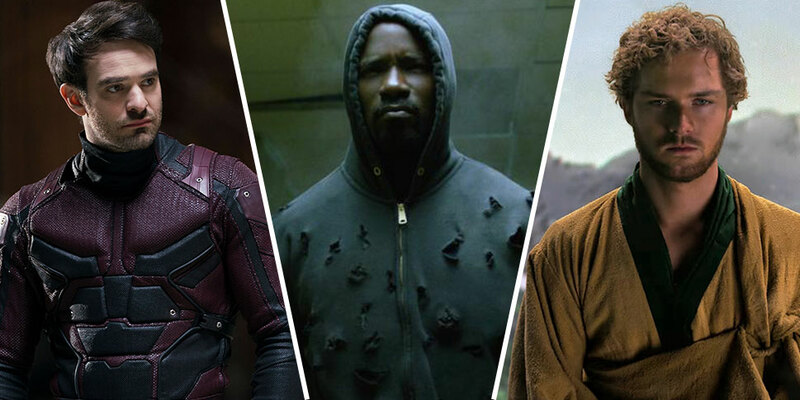 Such is the case with most of the Netflix original series Daredevil, Luke Cage, and Iron Fist — three of the five shows that make up the Netflix Marvel Television Universe. It all started on October 12, 2018. It seemed like such a normal day, that is, until it was first reported that after two seasons, Marvel’s Iron Fist had been cancelled by Netflix. This came as a shock to most Marvel fans everywhere for several reasons. Firstly, after a critically destroyed first season, Iron Fist had significantly upped its game for its second season. The second season was decently well-received, and after ending on a huge cliffhanger, along with the fact that it was a part of the critically successful Marvel franchise, it seemed assured the show would get at least one more season. But to be honest, the main reason people were so shocked by the cancellation of Iron Fist was because it was the first one. The 5 Marvel shows on Netflix were such a big hit with fans that it seemed as though nothing could touch them. After the cancellation, fans were disappointed, certainly, but this one was at least somewhat understandable. It wasn’t until one week later, on October 19, that the shock became more real. After 2 well-received seasons, Netflix and Marvel announced in a joint statement that Luke Cage would not be renewed for a third season. This one threw most people for a loop, considering the show had good reviews and the third season was already well into development. Apparently, the show was not picked back up “due to creative differences and the inability to agree to terms for a third season of the show.” Apparently, Netflix wanted to change the number of episodes from 13 to 10, something that Marvel was against. Half of the seasons scripts were already written, despite the fact that the show had not been picked back up. After the first two cancellations, fans were upset, but seemed to be more confused. Then, rumors started circulating that this was actually a move in order to create two new shows on Netflix — Heroes for Hire, which would have had Iron Fist and Luke Cage teaming up as, well, heroes for hire, and Daughters of the Dragon, which would have paired up Misty Knight from Luke Cage and Colleen Wing from Iron Fist as a crime-fighting duo. Even though nothing had been confirmed, fans still had hope that these heroes were not gone for good. After an incredible third season, a season that outdid itself in every way, Netflix announced on November 29 that Daredevil would not be returning for a fourth season. Everyone, from the Daredevil actors to Marvel executives and especially the fans, was flabbergasted that Netflix would cancel Daredevil, easily one of the streaming giant’s star players. Season 3 of Daredevil creatively beat out season 2 in every way. Season 2 of Daredevil had a huge act to follow after season 1, and also had a clear purpose — to set up The Defenders mini-series. It was basically forced into introducing both The Punisher and Elektra in the same season, all while setting up the backdrop of The Hand for The Defenders series. All this took its toll on season 2, and it was not as well received as season 1, though it definitely had its high points. But season 3…just wow. It was like Daredevil had truly found itself again. It was on par with season 1 in terms of story quality and action, and even included one of the best one shot sequences I’ve seen in a television show. In fact, Netflix actually used this success in its cancellation announcement when it say it was best to go out on a high note. To be fair, the showrunner ended season 3 in a very fulfilling way. There was a tease in the end for season 4, but it did bring the whole Wilson Fisk saga, which began in season 1, full-circle and to a satisfying end. Almost every character ended in a good place, and it would have meant messing things up to continue the story – though this is true of pretty much every superhero story. But still, after such as successful season, the fans were desperate to continue the story of the Man Without Fear, and were understandably crushed when they learned the story was over. After the cancellation of Daredevil, it now seems inevitable that the streaming giant will now be ending the entire Marvel Television Universe that they helped to create. But fans are desperate to know one thing: Why? Most, though admittedly not all, of the Marvel shows on Netflix have been applauded by the masses. I can kind of understand Iron Fist and Luke Cage, due simply to the fact that they were the least well-received of the Marvel shows. But why cancel such popular shows as Daredevil, Jessica Jones, and The Punisher (the latter two have not yet been cancelled) when they still had such an engaged audience and had been so well-received by critics and audiences alike? Surrounding these cancellations are the rumors that relations between Marvel and Netflix had been deteriorating as of late. As mentioned above, Netflix wanted the Marvel shows to reduce their episodes per season from 13 to 10. But in addition to this, Marvel’s parent company Disney has a new streaming service that is set to come out at the end of this year. Disney will be pulling all of their properties off of other streaming sites and putting them solely on the new Disney+, cutting off a significant and popular portion of Netflix’s current library. To make matters worse, while Netflix pays to produce these shows, they do not retain ownership of the shows – IP ownership still remains solely with Marvel and Disney. So, in effect, Netflix is paying money to produce content for a company that will soon be a direct competitor in the streaming service industry. And, because popular Marvel shows on Netflix could make audiences want to watch other Marvel shows, Netflix would, by default, be providing advertising for its direct competitor. When looked at from Netflix’s point-of-view, these cancellations are actually understandable. But after the cancellation of Daredevil, there was a bit of awkwardness left in the air due to the fact that there were still 2 seasons of Netflix-Marvel series left to be released. On January 18, 2019, the second season of The Punisher was released on Netflix, and a third season of Jessica Jones is still scheduled to premiere later this year. Well, due to everything I just mentioned above, both of those shows will almost certainly be cancelled, despite the fact that these are still popular. The second season of The Punisher did fairly well- it currently has a 52% critics score on Rotten Tomatoes, but holds an 83% audience score. And Jessica Jones has always been considered the next best series after Daredevil, so I’m sure we have something to look forward to in Season 3. But really, it all doesn’t matter. If Netflix decided to twice-blindside the entire Marvel fanbase and renew either of these shows, there would certainly be uproar. After the success of Daredevil’s third season, how could Netflix possibly justify renewing either of these shows, even if The Punisher and Jessica Jones are better received. They would be going against every reason and excuse they’ve used to cancel Iron Fist, Luke Cage, and Daredevil. So, will these shows ever see the light of day again? Unfortunately, the answer is, most likely, not. There have been several online petitions set up by fans for Netflix to renew Daredevil, which have been supported by many of the cast, including Charlie Cox and Vincent D’Onofrio. One of these petitions has over 248,000 signatures. But, most likely, Netflix will be sticking to its decision. That leaves it in the hands of Disney. And with Disney+ coming, you’d think it was likely Disney would bring the shows to its own platform. However, there are many roadblocks to this as well. For one, there are still contracts between Disney and Netflix in place that prevent Disney from using these characters for several years after cancellation. But more than that, the Disney+ site is currently being marketed as a family-friendly service. These shows are definitely not family friendly, and it would be a disservice to the shows and fans to make them so just to move them to Disney+. Plus, Disney is already planning several new series that are definitively set in the Marvel Cinematic Universe, including a Loki series and a Vision and Scarlet Witch series. As sad as it is to say, it does seem as though the Netflix/Marvel Television Universe is, indeed, dead. At this point, there are so many different components that would need to align that it just doesn’t seem possible. Should some miracle happen and Marvel finds a way to bring Daredevil, Luke Cage, and the rest back, it would most definitely be to its benefit. All of the actors, and I mean ALL of them, have commented publicly that they wish they could have continued telling these stories. They’ve gone on record saying that it doesn’t feel real, and most have stated that they would definitely return if their characters were needed again. As the Marvel characters have all crossed over in the comics, it is possible we could see someone like Wilson Fisk showing up in a Spider-Man movie, or possibly having a stand alone movie for these characters. So, there is a small glimmer of hope left. As long as Marvel hold out hope, the fans will, too. So, take a deep breath, say a prayer, and keep on hoping that, one day, these heroes will make their way back. The sixth Netflix/Marvel show, The Defenders, was a one season, 8-episode mini-series. As there were no existing plans for a second season, The Defenders was not included in this article. The Netflix shows did take place in the MCU, evident through small references made throughout the years, but always went at their own pace- the events of the MCU never included what happened in the shows. For more articles by Tyler, click here.